The YMCA Campbellton Youth Centre, branch of the YMCA of Greater Moncton, officially opened in Fall 2014 thanks to the support of YMCA staff, volunteers, community partners and donors. 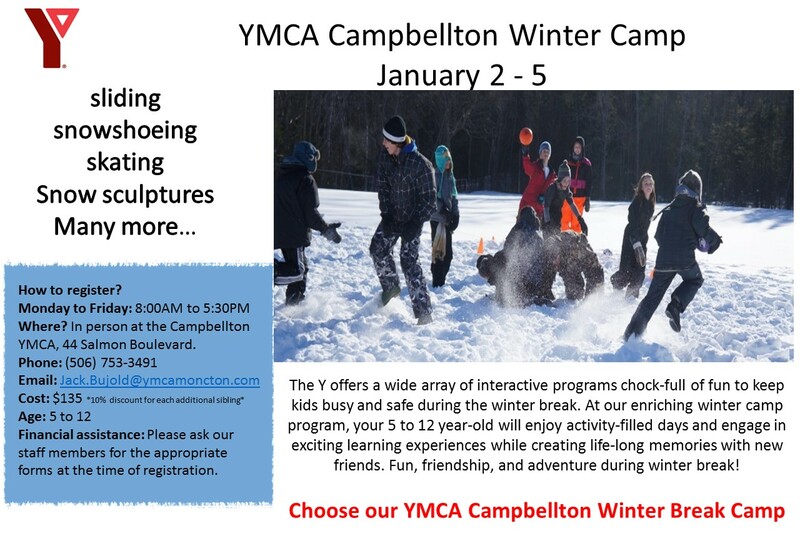 The Youth Centre is home to our YMCA Youth Zone, Afterschool care and Camp programs. Situated in the Civic Centre, the YMCA Youth Zone, offers a safe, fun and supportive drop-in environment for youth ages 12 to 17 and has seen participation grow from across the Restigouche County It is a great way place for youth to connect, be active, and free from boredom! Join the thousands a kids across Canada who end their school day at the YMCA! YMCA staff develop a special relationship with each child, helping them develop new physical, cognitive, emotional and social skills in a nurturing environment. We operate Monday to Friday, from 1:30pm until 6:00pm. Full day services on PD days, storm days and Christmas Holidays. At the YMCA, we believe healthy, vibrant communities give everyone the opportunity to learn, grow and thrive. If you have interest in becoming involved with your local YMCA as a volunteer or donor, for more information, visit or click here?